If you have seen our site about Hungaricums you probably know how we got the idea to visit Herend Porcelain Factory. But if you just started your visit with this page on our Best Things In Hungary website and you are interested how this story began, please click here to go back to Hungaricums. So, my wife and I decided to visit the famous Herend Porcelain factory during a long weekend trip. You can see below on the map that Herend is situated very close to the Lake Balaton, the biggest lake in Central Europe, in a romantic natural environment among the slopes of the Bakony hills. When you visit Hungary and you spend some days around this beautiful lake, it is worth reserving one day to visit this legendary factory. I don’t want to be wikipedia and bore you with dry historical stories, but I think it will be interesting to tell you some basics facts. 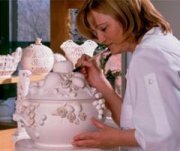 Herend is the centre of artistic porcelain production in Hungary and it is the world's largest porcelain factory, which has been operating for over 180 years. The company started in 1826 as a factory with just a few employees and became a favored brand. Today Herend is known in almost every country of the world, and it is a true Hungaricum. What can you do in Herend? There are many possibilities for fun activities to do in Herend that will suit your interests. The three main attractions are the Porcelain Museum, the Mini Manufactory and the Coffee and Porcelain Shop. Depending on the season there are many other activities, like wine-tasting events, the razzmatazz of Midsummer Night, temporary exhibitions and one-off events. When we visited this amazing place it was late autumn, and we were “just” able to experience the three main places of interest. I put the “just” in quotes because what we saw there was much more than I expected. We started our voyage of discovery in the Mini Manufactory, continued in the Herend Porcelain Museum and finally ended in the Coffee shop, of course. This is an unbelievable place. I was really impressed here. The tour in the Mini Manufactory starts with an interesting short movie about the story of Herend porcelain from 1826 to the present day, but only afterwards does the real magic begin. As the Herend film ended, a local guide escorted us through the Mini Manufactory. This is a miniature copy of the operating factory and this is the place where all that we have seen and heard in the movie comes to life. It was very fascinating to see how heavy mass becomes fragile porcelain and how the craftsmen shape, decorate and paint the material. We could follow step by step the birth of those beautiful masterpieces. There were lots of nice moments when I really held my breath. Just to give you an example. 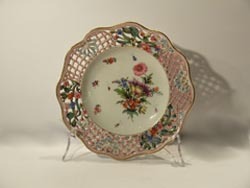 My favorite moment was when the artist starts painting the porcelain with special brushes. It is really unbelievable, how these people can draw and paint the motifs, for example, on a dinner plate. Did you know that each and every piece from Herend is hand painted? I think this is matchless and that’s the reason why every piece is unique. The professionalism of these people who are dreaming and creating these unrivaled masterpieces is astonishing. Of course not just the painting was fascinating. The making of porcelain rose and basket was also an unforgettable moment. There, on site, as we were seeing the masters, it becomes apparent what skill and patience is required for the hard, but beautiful profession of porcelain making. I was always wondering why these Herend porcelain statuettes, vases, and painted plates are so expensive. Now, I know it. What we have experienced there is needed for us to evaluate and appreciate the value and the craftsmanship of a porcelain object that we buy or receive as a gift. I recommend you to visit the Herend Porcelain Museum after the Mini Manufactory. You will receive an overall picture about the colorful product range of Herend porcelain. The Manufactory has a capacity of producing more then 16,000 various forms, around 4,000 patterns and their free variation. This means it is equivalent of 64 million various products. Of course you won’t see 64 million porcelain pieces in the glass cabinets, but you can admire the most significant ones. They are really amazing masterpieces. It is no accident that the most famous rulers of the 19th and 20th century fell in love with Herend porcelains. For example: Queen Victoria, Emperor and Hungarian King Franz Joseph and his wife Queen Elisabeth, Alexander von Humboldt, Nikolas II of Russia and the most loved one, Lady Diana. I can continue the list with the most famous and determinant persons of the 21st century such as the Pope Benedict XVI, Lewis Hamilton and Arnold Schwarzenegger. I have one practical hint for you. Be careful with the motion sensors! I had a bad experience with them. There was a very nice picture painted on a porcelain plate. The plate was hanging on the wall a little ways from the walking area. I wanted to get a nearer view of this plate, so I stepped closer to it. This was a big mistake, because the alarm immediately started to ring and the guard jumped over to catch me. So be careful with these sensors, they are very sensitive! After taking the Mini Manufactory tour and walking through the two floors of the Herend Porcelain Museum, it is time to sit down with a good cappuccino in the Apicus restaurant and café. You can find it in the Porcelanium visitor center just next to the Mini Manufactory. This is a very nice, relaxing place. I think it is needless to say, that the whole place is decorated with porcelain, of course the food and coffee is also served in traditional local made porcelain. I highly recommend trying some original Hungarian cakes here, you won’t be disappointed. Here you can find all the practical information you might need if you decide to visit Herend. Thanks to Google Maps, you can plan your trip using the below map. You just have to give the location from where you wish to start, and Google will guide you there. Preliminary group reservations are taken during the above mentioned period of time. Mini Manufactory and visit to the Museum and a cup of coffee or tea free of charge in the Apicius Café. (except for those entitled to students' admission fee). • pensioner over 70 years, handicapped persons. Admission to the Mini-manufactory is only possible with a guided tour. Tours start every 15 minutes. Individual visitors will be assigned to time slots reserved earlier for groups. Due to maintenance considerations, there are no guided tours in the Mini-manufactory at 12:30, 12:45 and 13:00. • Visitors may choose Hungarian, English, German or Spanish language tours of the Mini Manufactory. • Films showed in the Mini Manufactory are in Hungarian, English and German or with English, French, Japanese, German, Italian or Spanish subtitles. If requested in advance, the Museum can organize guided tours in Hungarian and German. • The charge for guided tours in Hungarian is HUF 1,500 per group. • The charge for guided tours in German is HUF 3,000 per group. Have a nice time in Herend!